This article appeared in the Kirkintilloch Herald on November 18th 1925. Beautifully situated at the side of a small wood, adjoining the banks of the Forth and Clyde Canal, stands Cadder Parish Church, about two miles from Bishopbriggs. A church has stood on or near this site since at least 1150, and the living was held by the Sub-Dean of Glasgow Cathedral. The first pre-Reformation church of which any account has been preserved was a building of handsome proportion, which from the lack of funds after the Reformation fell into decay, and was replaced in 1750 by a mean building which stood only for 75 years. 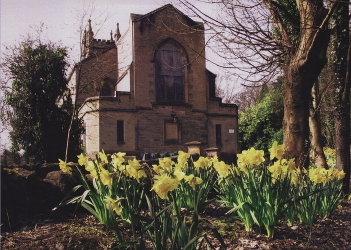 The present church was completed in 1829, and renovated in 1909, through the liberality of of the congregation and the Heritors, by the addition of a chancel and the opening up of the flat roof, the re-seating of the area, and providing a new organ chamber. In the churchyard "fond remembrance has raised many sculptured stones," some of which date back to the beginning of the seventeenth century. In conversation with the beadle, who is a very old friend of the writer's, I was informed that at all the internments the bodies are buried facing the east. Where there is a headstone this often causes (in certain parts of the kirkyard) the feet being placed at the tombstone, instead of the usual custom of placing the top of the coffin in that position. The idea is, I believe, that the dead shall rise on the Resurrection facing the east, from which the Saviour will come. There is a small stone house in the centre of the kirkyard, where in earlier days watchers took up their lonely vigil in order to protect the dead from the body-snatchers. Outside the house there is an iron coffin measuring 12 inches deep, 7 feet long and 21 to 31 inches broad at certain parts. The coffin is ½ inch thick, and I understand from the four handles attached to the sides that it had been intended for placing over a coffin inside a grave, and thus prevent interference with the dead. This coffin had been the property of a Miss Wilson, who previously farmed the the ground of Easter Crosshill, in the Bishopbriggs area of Cadder Parish. It had been used as a watering trough for the cattle, and when these animals were removed from one field to another two horse were yoked to the coffin in order to take it to the required field, so that the cows would still be able to satisfy their thirst. On the death of the lady, her effects were disposed of, and the late Rev. J.B.A. Watt, the minister at Cadder from 1882 up to his death in 1911, purchased this grim relic and had it placed in the kirkyard, where it is now used as a seat. Where it had its origin it is impossible to find out, for those acquainted with its history have long since joined the great majority. Inside the church there is much that is of interest. On the lintels above the door we find the names of the members and adherents of the church who joined H.M. Forces during the Great War, 1914-1918, with this inscription, "They sought the glory of their country," a total of 204 names, 46 of which made the supreme sacrifice. The coats of arms belonging to the different landowners in Cadder parish adorn the walls. There are a number of beautiful stained-glass windows in memory of relatives and friends, two by Sir Hugh Reid, Bart. of Belmont, Springburn, in memory of his wife, and to the memory of his son and his comrades from Springburn who fought in the Great War; another by Caroline Warren in memory of husband and sons; and one to the memory of Mr. James Noble, late schoolmaster of Cadder, and session clerk of Cadder Parish Church for 53 years. The congregation have placed one in memory of the men who fought and died in the Great War, and another to the memory of the Rev. J.B.A. Watt. The church, which has a back gallery, is capable of seating 600. The front pew in the gallery is allotted to the Stirling family, who own the ground around the church (the present laird, Brigadier-General Stirling of Kier, is an adherent of the Roman Catholic Church) and instead of a long seat there are six hair-stuffed chairs. In the chancel there is a brass plate with the names of the following ministers and the year of their occupancy of the charge:- 1695, David Ewing; 1731, Jas. Warden; 1746, Alex. Dun; 1793, Archd. Provan; 1818, Thos. Lockerby; 1837, John Park; 1882, J.B.A. Watt. In the vestry there is a call with the following:- "Cadder, 28th February, 1793. The Presbytary of Glasgow having this day met in a call in favour of Mr.Archd. Provan, preacher of the Gospel, top be minister of the parish of Cadder, and a call for that purpose having been drawn up and signed by a number of the heritors and elders of the said parish accordingly we, the subscribers, being the heads of families in the said parish, do hereby concur in said call." Then follows 20 signatures, some of which are marked with an "X". The interior of the building is of a handsome appearance, those in charge sparing no pains to keep the sanctuary "beautiful, entire and clean." A pipe organ, assisted by an able choir, lead the praise, while the high tradition of the pulpit is well maintained by the present minister, Rev. J. Woodside Robinson,B.A., widely known as the author of "Sunlit Hopes" and other books.